A great salad is part perfectly fresh and delicious ingredients and part winner dressing. And the simpler the better. But salad monogamy is not something I believe in. There shouldn't be exclusivity with salad combinations and dressings. A good vinaigrette should be able to play the field. And let me tell you, the mint vinaigrette in this recipe sees a lot of action in my kitchen. Does it look familiar to you? If you took my class last July, you had it with a Farro, Golden Beet and Cucumber Salad. If you saw the feature in ELLE Magazine of my class at Jenni Kayne's and looked up the recipes, you saw it there, too. But what you don't know is that I have been using this dressing for years on lots of things and you will too! Why do I love this dressing? Mint is one of my favorite herbs in both savory and sweet dishes. Combined with rice vinegar and red onion, it is fresh and tangy and I could drink this dressing with a straw, I love it so much. It is just perfect with asparagus, peas, cucumber, beets, carrots, potatoes and green beans. 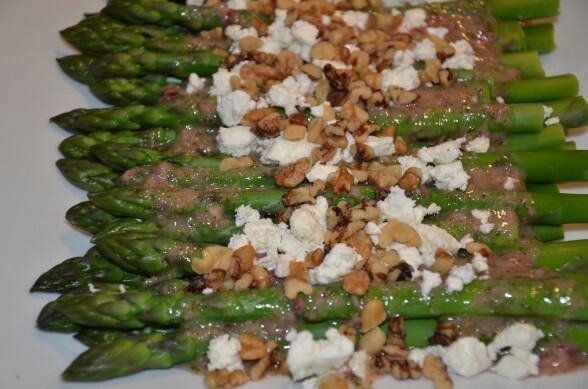 Here I've shown you this asparagus salad prepared two ways - either sliced and mixed with butter lettuce or whole spears drizzled with dressing. Easter is just around the corner and I think this would make a lovely light salad for brunch or a perfect complement to roast lamb for dinner. Don't forget about how nutritious asparagus is. Asparagus is loaded with potassium, Vitamin C and folic acid, which is critical for proper cellular division (especially if you're pregnant.) It also contains inulin which we don't digest, but the good bacteria in our gut do. We want to promote the growth and activity of friendly bacteria so that they make it more difficult for unfriendly bacteria to take over our intestinal tract. Asparagus is also rich in vitamin K, calcium and magnesium, all helpful in building bone strength. I guess you could call this salad a win-win! Prepare a large bowl of ice water. Bring a large pot of salted water to a boil and blanch the asparagus spears for 3 minutes for medium thick spears (less for thinner). 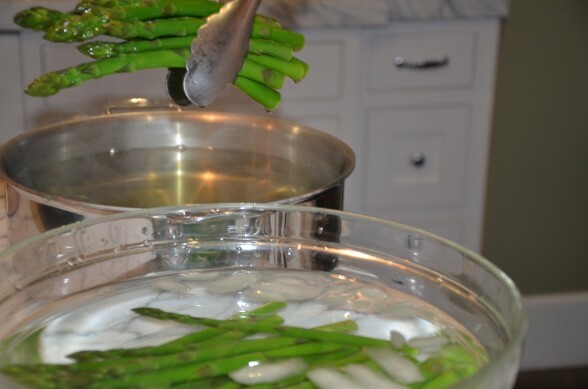 Remove asparagus with tongs and immediately submerge in the ice water. Once cool, remove asparagus to dry. To prepare the dressing: place the mint leaves, garlic, rice vinegar, honey, diced onions, salt and pepper in a blender or food processor. 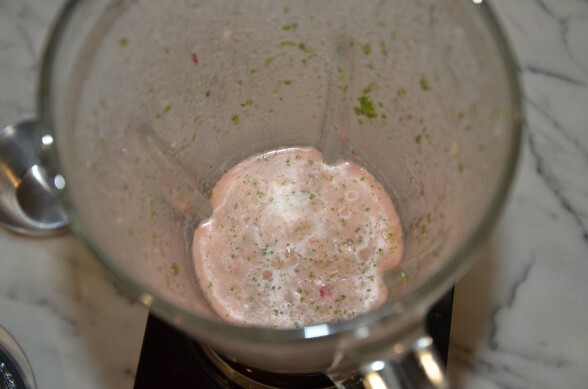 Begin to blend and with the motor running, add the olive oil in a slow stream. Season to taste with sea salt and pepper. Place lettuce on a platter and toss with enough dressing just to coat. Dry asparagus well and cut on the diagonal into fourths. Toss with a little dressing and add to lettuce. Scatter feta and walnuts all over salad and add more dressing if necessary. The second photo shows how I store asparagus. 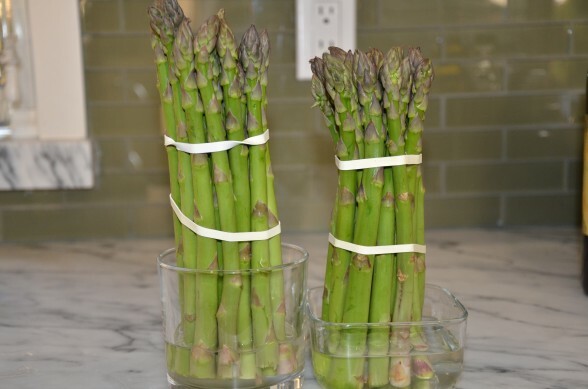 When you bring it home from the market, trim the ends of the asparagus and store in a container with an inch of water at the base. Keep refrigerated. The asparagus will stay fresher for longer. When trimming asparagus to cook, bend the asparagus back close to the bottom and find the natural break in the stalk. Prepare as desired. Not only does this look delicious but beautiful as well! I am so glad I have all the ingredients at home. This will be at our holiday table this week. Thanks for sharing it at the Real Food Holidays Blog Carnival! It really is a pretty dish. You can prepare much of it ahead of time and assemble it at the last minute which is helpful for a holiday dinner. A PS to my response…When I made the recipe I cooked extra asparagus and prepared extra dressing and refrigerated both. The next day I cooked some quinoa and added the asparagus, feta, toasted pine nuts, chopped parsley and mint, and the dressing – mixed everything, and had a variation on your great recipe. I bet your variation is amazing! I am crazy about quinoa with mint, as well as feta. Thank you! dressing. How can I convince the Salzmans to move to the “Garden State?” Pamela, you already have so many fans here who would love to take your classes (like me, a Jersey girl). What do you think? Remember, you were born in NJ! I do have a soft spot for New Jersey since I was born there, but it’s hard to give up all this great So Cal produce and weather! This dish tastes as good as it looks. It was a hit at Easter….Thank you! Terrific! I actually make this salad all spring and summer — it’s not just for Easter :). Just celebrated our Greek Easter with the traditional Lamb and potatoes and as a side dish, I did your asparagus recipe, everyone loved it! I’m so happy to hear that. I hope you had a wonderful holiday! Any more suggestions of ways to use the dressing? It’s AMAZING!! I agree! You’ll have to check out the farro recipe — it’s delish. 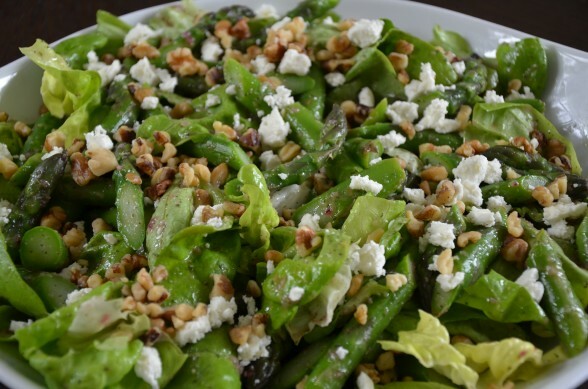 But one of my favorite ways of using this dressing is on steamed, boiled or grilled potatoes with or without green beans, with or without feta and walnuts. I mentioned a couple more complementary vegetables in the blog. You pretty much can’t go wrong with a winner! Whenever I make that mint dressing, it’s a hit!!! I love all your recipes Pam!!! Thanks, Danielle! I just made this for dinner last night. It might be my favorite dressing! I used chopped pecans instead of walnuts (all I had on hand) and it was still delicious! The dressing is also great over spinach! Did I mention the dressing is great on a spoon? Thanks for the feedback! I made this dish this weekend. It was very easy to follow the recipe and it was very good. My guests wanted the recipe. I gave them your amazing website instead. Because of you I am a better cooker. My family does not dread dinner anymore! Thank you Pamela! Haha! I’m happy for you that your inner cook is coming out. Absolutely love this recipe! Can’t wait to serve it for Easter dinner. I love asparagus. This dish looks so delicious. I can’t wait to try it!